Good location; just a couple of minutes from the "action" i.e. the harbour and all the restaurants etc. Taxi rank right in front of it. Friendly staff. Πολύ καλή τοποθεσία. Όλα κοντά με τα πόδια Φιλόξενο και ευχάριστο προσωπικό. Καλό το πρωινό. L'unica cosa positiva era la posizione. Tutto il resto è pessimo. A localização é boa, perto dos restaurantes, bares, lojas e do porto. O café da manhã é bom. Πολύ καλή τοποθεσία, είναι πολύ κεντρικά στην Χώρα. Οι ιδιοκτήτες ήταν αρκετά φιλικοί. Το ίντερνετ καλό. Posizione ottima, personale cordiale e disponibile. Ottima la colazione con yogurt locale! Titania Hotel Karpathos This rating is a reflection of how the property compares to the industry standard when it comes to price, facilities and services available. It's based on a self-evaluation by the property. Use this rating to help choose your stay! 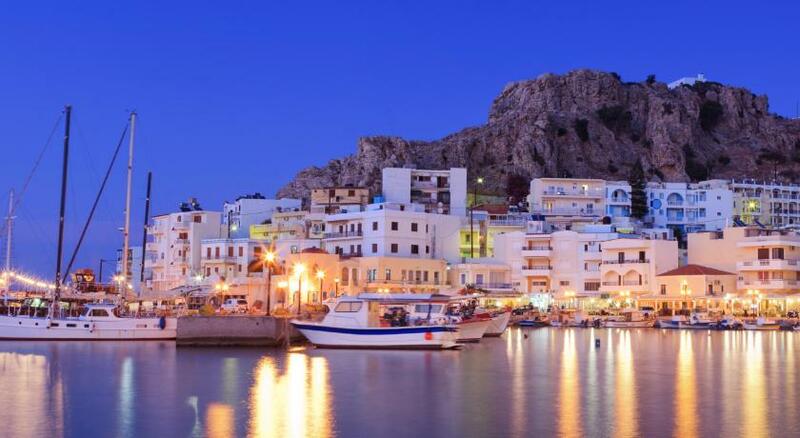 Centrally located in Pigadia, the capital of Karpathos, Titania Hotel is a 5-minute walk from Xenonas Beach and the harbor. It offers a buffet breakfast and rooms with air conditioning. The rooms at the Titania are equipped with a radio, a hairdryer and private bathroom with shower. Some rooms have a balcony overlooking the Aegean Sea or the mountains. Some units offer free WiFi access. Breakfast is served in the dining room with views of the flower garden. The hotel features a bar that serves drinks and coffee throughout the day. Staff at the tour desk can arrange car rental and boat excursions. The scenic Olympos village is 37 mi away. Pigadia has shops, cafés and taverns with fresh fish. When would you like to stay at Titania Hotel Karpathos? 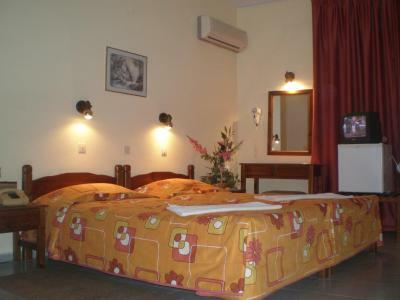 This air-conditioned room provides a radio, a hairdryer and private bathroom with shower. Free WiFi access is offered in some rooms (subject to availability). This air-conditioned room provides a radio, a hairdryer and private bathroom with shower. Some rooms have a balcony overlooking the Aegean Sea or the mountains. House Rules Titania Hotel Karpathos takes special requests – add in the next step! Titania Hotel Karpathos accepts these cards and reserves the right to temporarily hold an amount prior to arrival. The hotel has probably not been touched since about 1950. The room (with the beds) was ok but the bathroom was poor, with everything falling apart. For example the shower curtain stopped about 5cm above the base so a shower flooded the floor. The whole place needs a big refurbishment. Breakfast was about the most basic I have ever seen, with just choco and normal corn flakes, milk, and a couple of other things. I have seen places like this before but usually as a cheap, say 40 euro a night large city airb&b apartment in some 3rd world country.